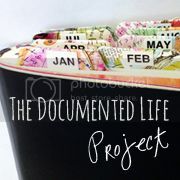 Welcome to Week 9 of The Documented Life Project! February 22 - Collage Something You Recycled. I LOVE to incorporate anything Re-Cycled or Re-Purposed into my projects, so this week was a fun challenge for me! I printed a tip-in that I created as part of the Premier Ensemble Digital Kit. My recycled pieces, hand dyed color catcher sheets, are something I incorporate into many of my mixed media studio projects, like this CHUNKY IDEA KEEPER featured in Stampington's Greencraft Magazine. For my flowers, I ran one sheet through my die cut machine and then stitched the flowers to the page using black thread - I like the contrast against all the bright colors. The ribbon-like band was created using a second dyed sheet that I cut, pleated and stitched over the top of a quote using the same thread and a free motion line stitch. I have been hiding inspirational and uplifting notes and cards in my children's lunch boxes for years. This quote was cut from one of those cards and added to my page along with a few fabric flowers. More black stitching around the edges added definition and really made the page pop! A little chevron washi tape I rescued from a piece of mail art and my page was complete! Found. Reclaimed. Repurposed. Just how I like it! I am looking forward to seeing your interpretations of this week's challenge and I can't wait to meet you back here next week! I don't use dryer sheets for my laundry, but I am going to have to start grabbing them from my mom - she uses them. And I will need to start dyeing them, too! Thanks for sharing! What a great page...i love all the color and especially the happy yellow flowers...not to mention the strong black and white contrast....so vivid and exciting! Ahhh,dryer sheets. Gonna need to save those from my sister and start using them as my catch all for wiping and maybe I just might actually die them, lol. Love your pages and the look into your journal.Thanks! You are so welcome Andrew! FYI - I am not dying dryer sheets - they are actually color catcher sheets that one can use in the washing process to trap extra floating dyes in the water. You can see an example of how they look dyed here! 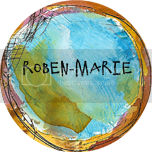 Thank you so much for stopping by to read and ENJOY! Thank you so much Sara! It makes me happy to work with such bold colors lately! AND I LOVE the pop of black and white too - ! Thanks Lynn! Let me know if you ever need me to pick you up a box or two and drop them in the mail! Here are a few that might remind you of the Chunky Idea Keeper Workshop! So colorful and so you with the dyed dryer sheets! Beautiful! tried to click on sandi's name but did not go to her blog or anything related but to search.